USS Wasp (CVA-18). 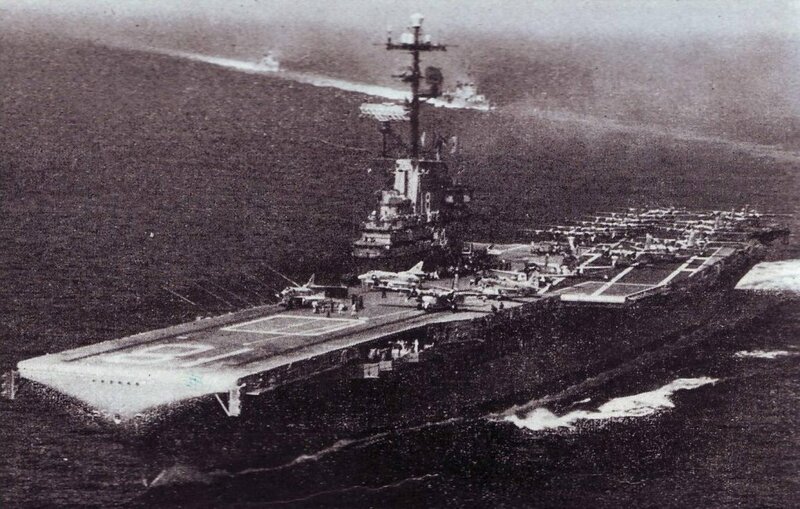 From Our Navy magazine, First of March, 1954. 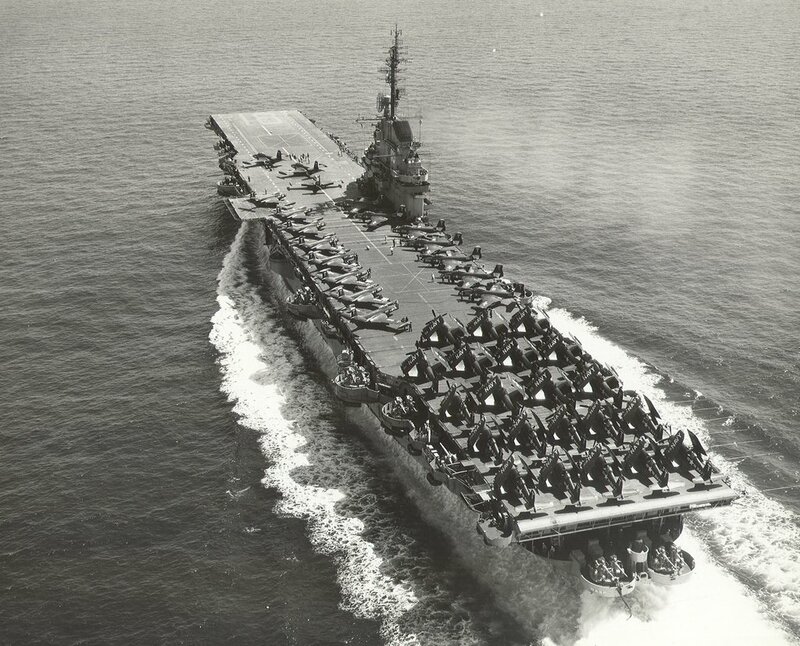 Photo was taken circa 1951-1952, just after SCB-27A modernization, with Carrier Air Group 1 (CVG-1) aboard. Four U.S. Navy aircraft assigned to Carrier Air Group (CVG) 1 aboard the aircraft carrier USS Wasp (CV-18) in 1951–52. The first and last aircraft are Douglas AD-4 Skyraiders, the first being the personal aircraft of the Carrier Air Group Commander ("CAG") while the other aircraft are the planes of the squadron commanders (front to back): next to the AD-4 of the CAG flies a McDonnell F2H-2 Banshee of Fighter Squadron (VF) 12 "Flying Ubangis;" then a Vought F4U-4 Corsair of VF-14 "Top Hatters;" finally an AD-4 of Attack Squadron (VA) 15 "Valions." 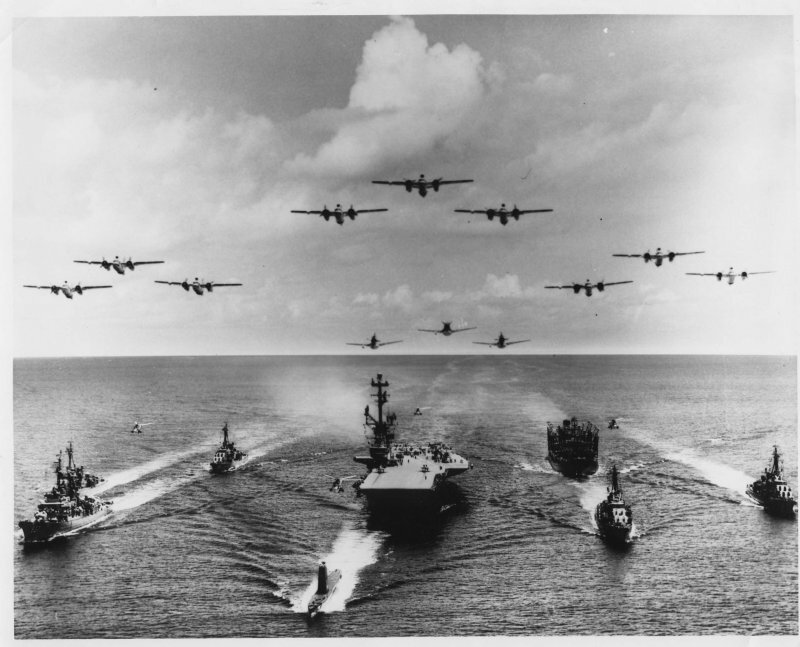 Photo from U.S. Navy publication Dictionary of American Naval Aviation Squadrons, Volume 1, The History of VA, VAH, VAK, VAL, VAP and VFA Squadrons; Chapter 2, Attack Squadron Histories for VA-1E to VA-23. 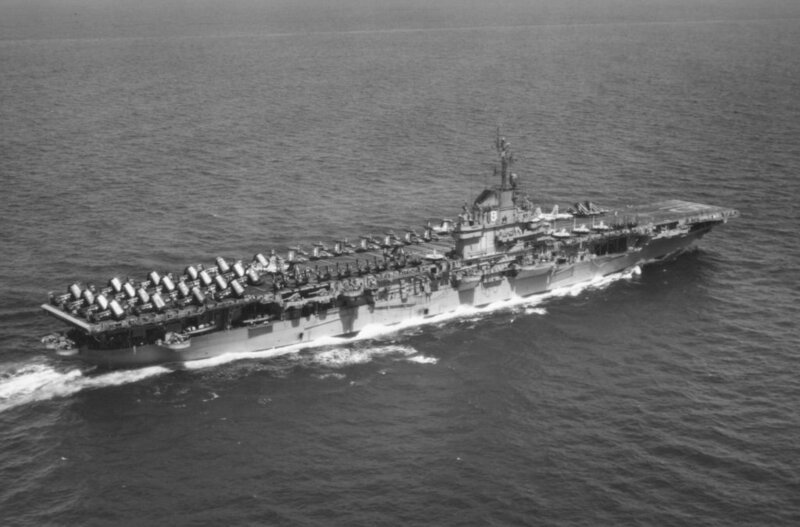 USS Wasp (CV-18) underway with Carrier Air Group (CVG) 1 embarked, 1951–1952. USN photo # 442111. 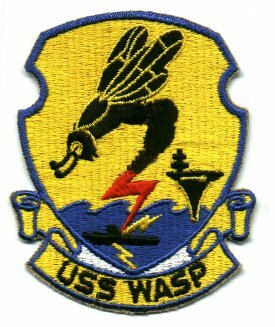 On April 26, 1952 Wasp collided with destroyer minesweeper Hobson (DMS-26) while conducting night flight operations in the Atlantic, en route to Gibraltar. Hobson was cut in two and sank. 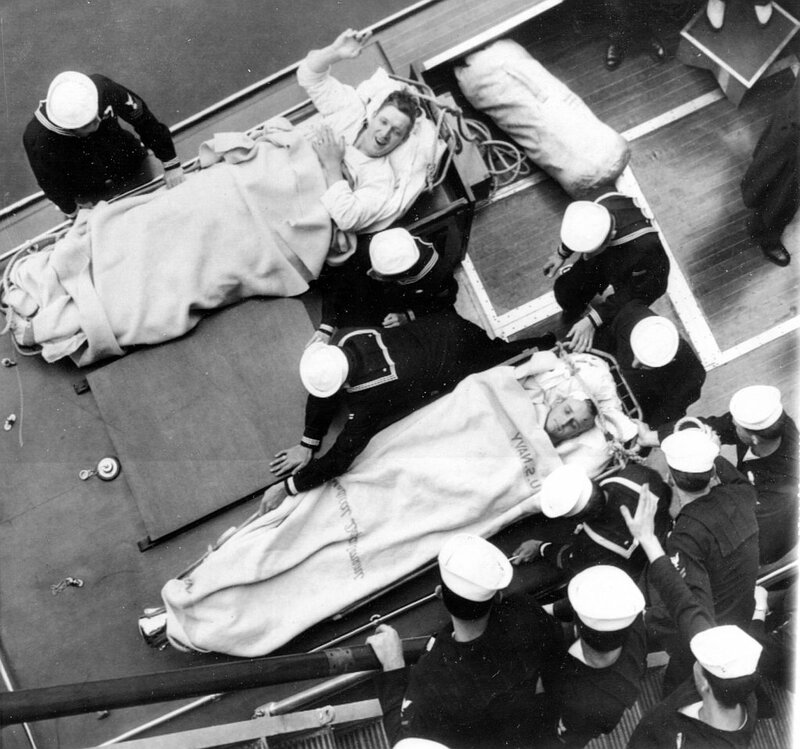 Rapid rescue operations saved 61 men, but Hobson lost 176 of her crew, including her skipper. 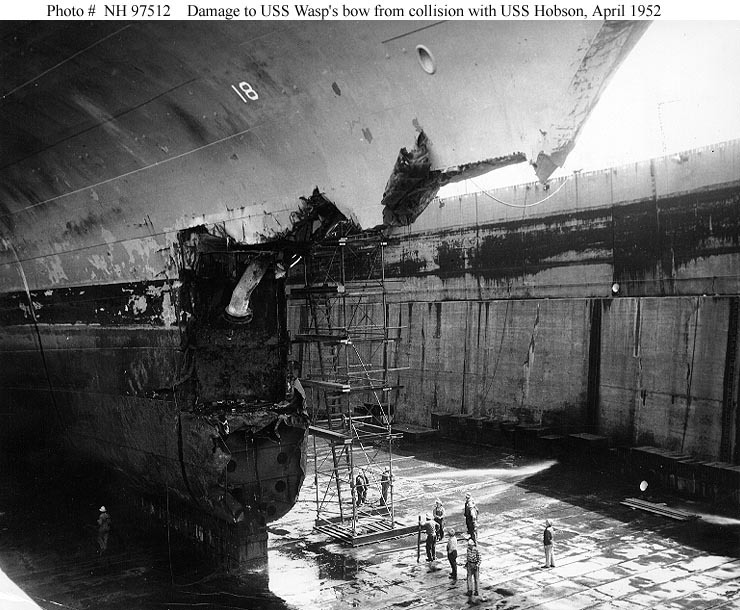 Although Wasp sustained no personnel casualties her hull was severely damaged, with a 30 x 50-foot bite gouged out of the bow. With the carrier urgently needed for duty in the Mediterranean, preparations for repairs were begun immediately. 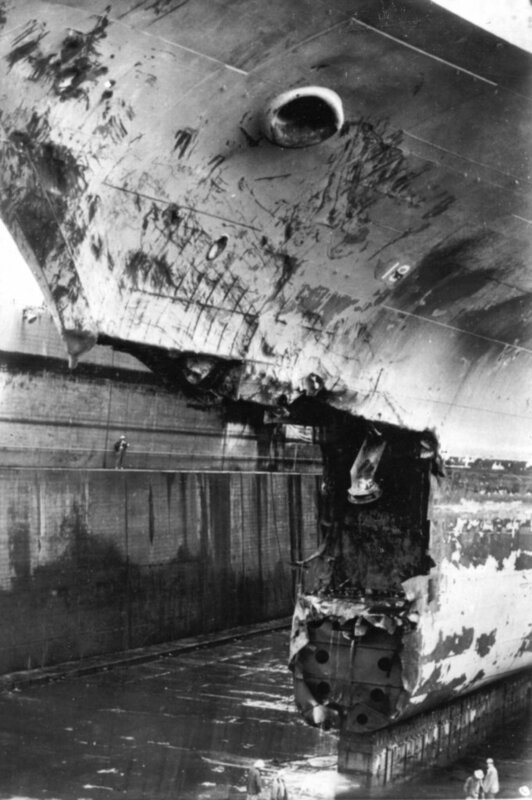 Wasp carefully proceeded to Bayonne, N.J., entered drydock there on 8 May and her damaged bow was cleared out with blow torches. 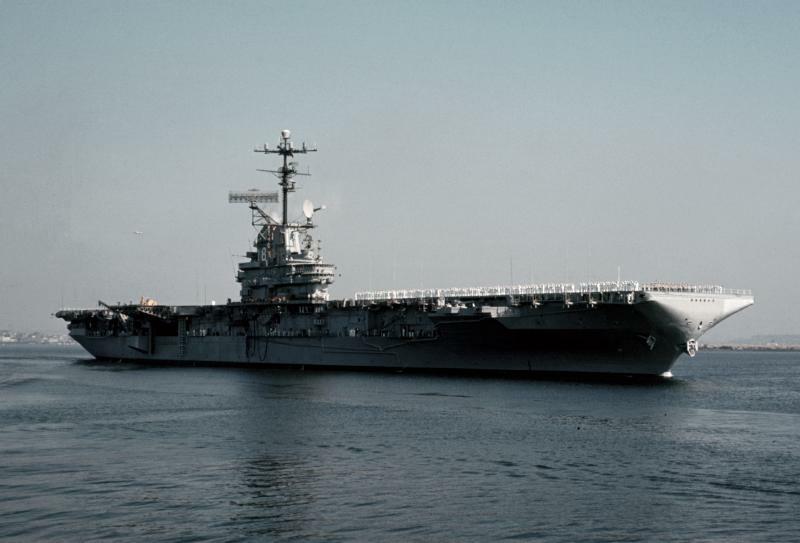 The following day, the bow of aircraft carrier Hornet (CV-12) —then undergoing conversion in Brooklyn, N.Y.— was cut off and floated by barge across the bay. 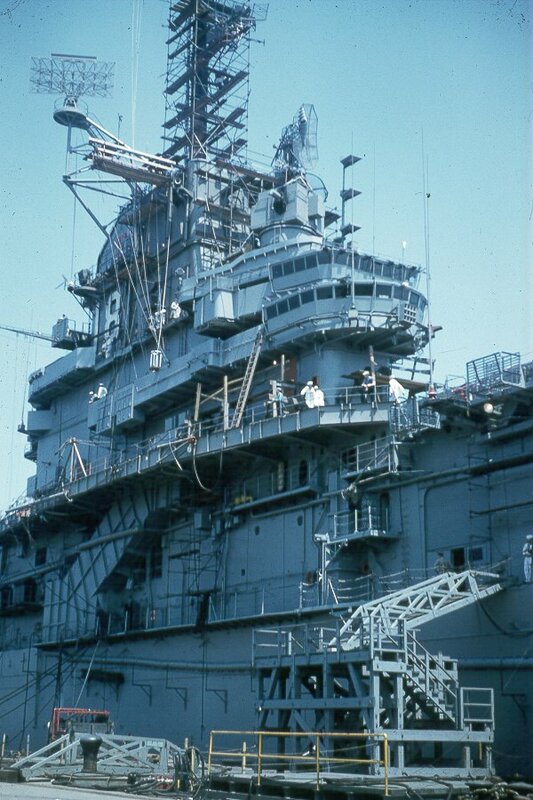 It was fitted into position under Wasp that afternoon, with steel plates to close any remaining gaps, and workers began round-the-clock welding operations. This remarkable repair task, which including replacing 61 lifeboats and refitting the carrier's anchor chain, was completed in only 10 days, enabling the carrier to get underway on 21 May. Shifting south to Norfolk, the crew spent a short three days preparing for deployment and Wasp sailed east across the Atlantic on 24 May. (NS021896) Wasp entering New York Harbor on 6 May 1952 after her collision with Hobson on 26 April 1952. Photo from the files of the Vallejo Naval & Historical Museum (# CVA 18 130X2-5-52). 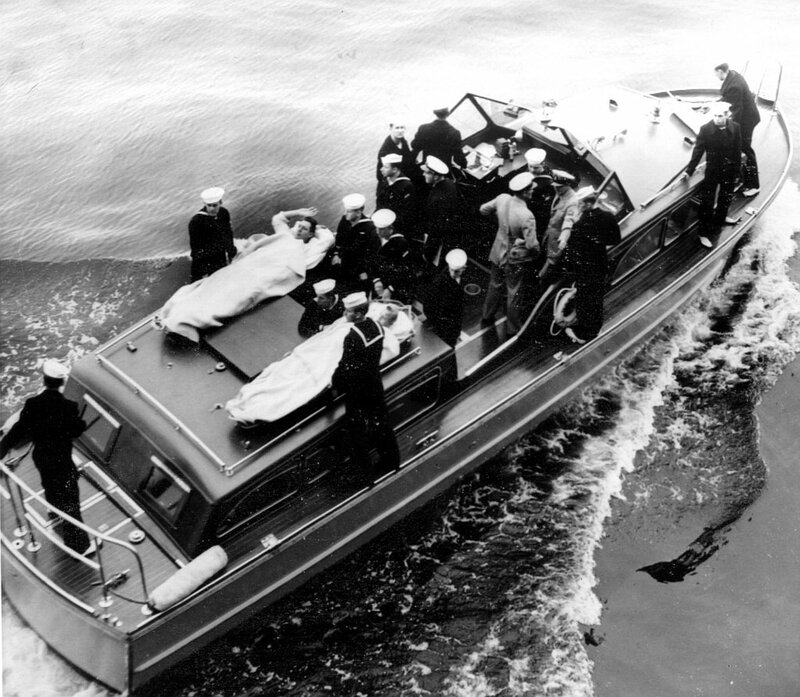 (NS021896a) Survivors of Hobson being transported aboard a Navy launch on 6 May 1952. Left to right on stretcher are CSC Gene St. Martin and RMSN David D. Sanford. Photo from the files of the Vallejo Naval & Historical Museum (# CVA 18 130X4-5-52). 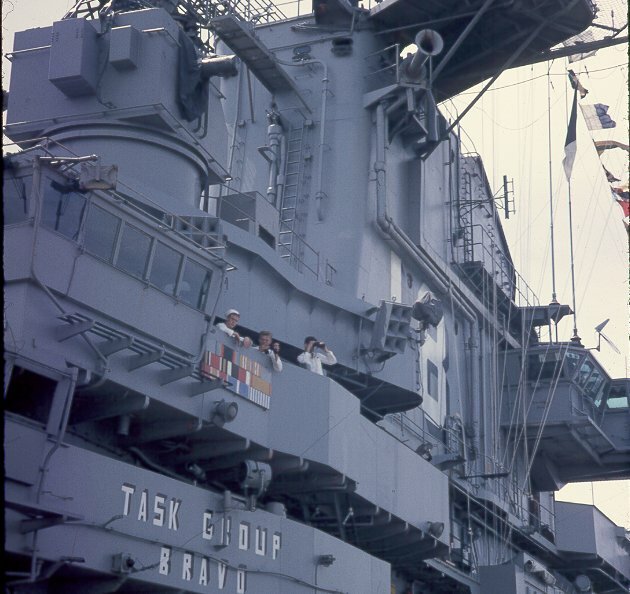 (NS021896b) Survivors of Hobson on the flight deck of Wasp on 6 May 1952. Photo from the files of the Vallejo Naval & Historical Museum (# CVA 18 130X6-5-52). (NS021863) Damaged section of Wasp's bow is shown as water drains from Bayonne drydock. Naval History & Heritage Command photo # NH 97512. 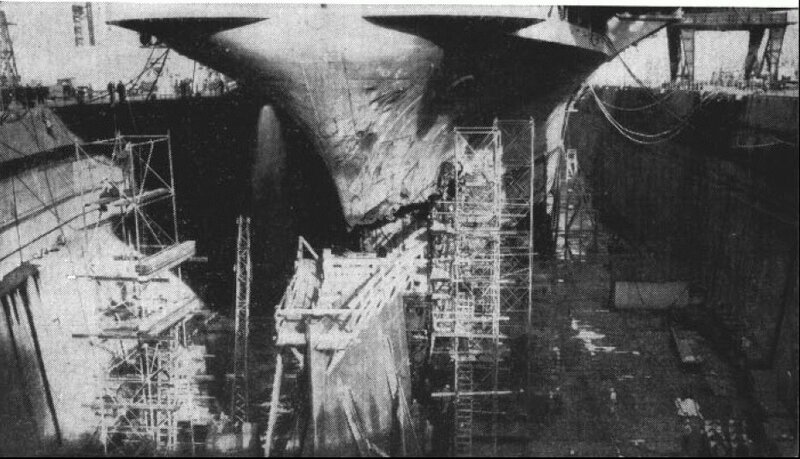 (NS021863b) View of the damaged bow of Wasp on 9 May 1952 in dry dock in Bayonne shipyard. Photo from the files of the Vallejo Naval & Historical Museum (# CVA 18 130X6-5-52). (NS021863a) Cradled Hornet bow is moved into position under Wasp just before the "welding ceremony." From "All Hands" magazine, July 1952 issue. 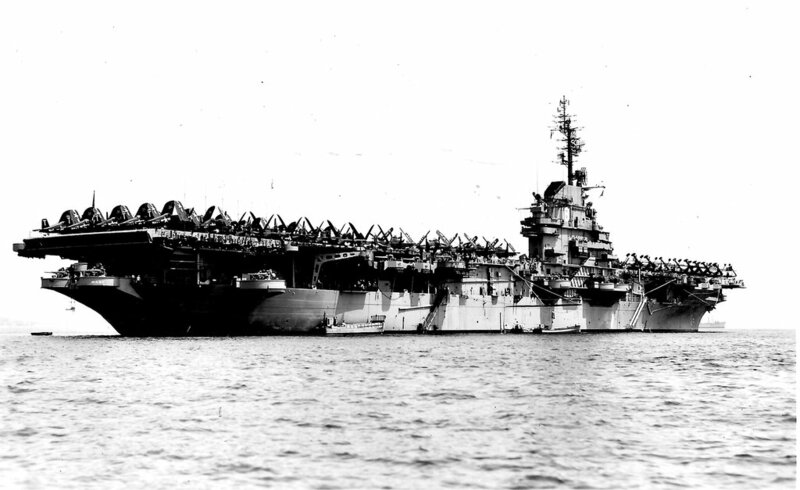 USS Wasp (CV-18) with Carrier Air Group (CVG) 1, 9 July 1952. Photo by Marius Bar, Toulon, France. 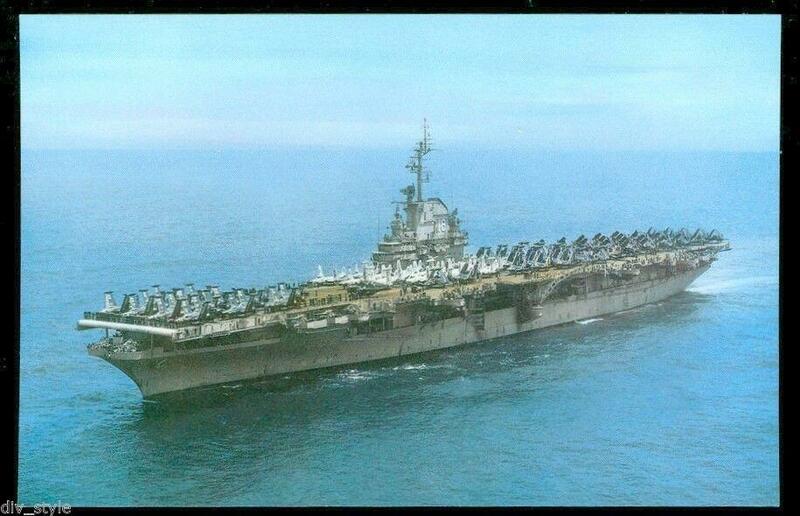 USS Wasp (CVA-18) circa 1953. 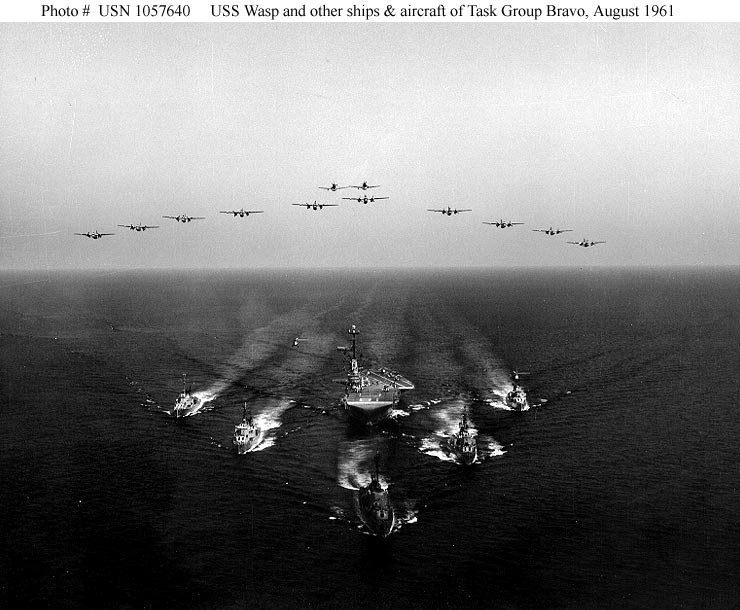 Official U.S. Navy photo from Jane's Fighting Ships 1958–1959. 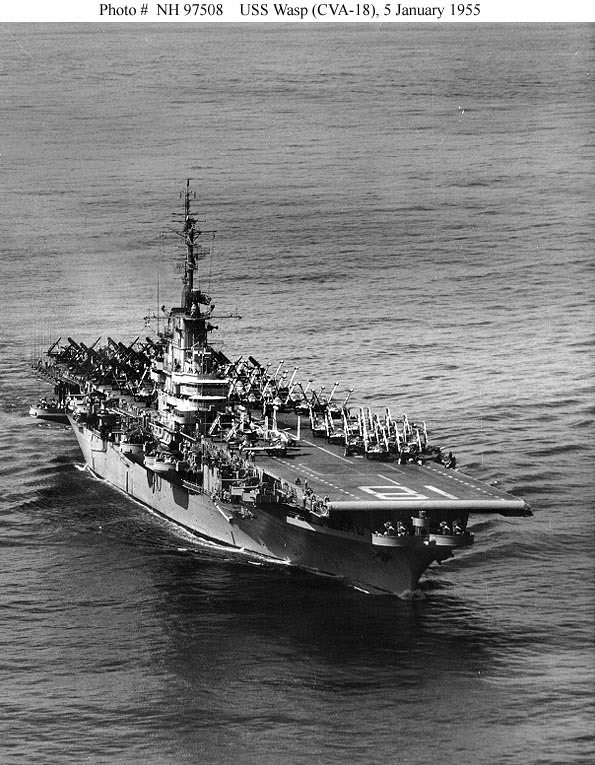 USS Wasp (CVA-18) underway during her World Cruise, Norfolk to San Diego, 16 September 1953–1 May 1954, with Carrier Air Group (CVG) 17. 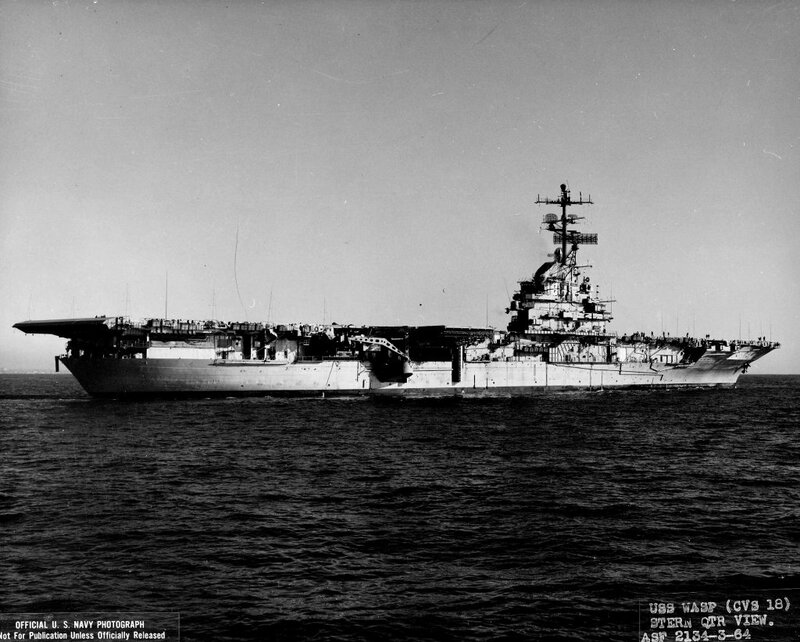 USS Wasp (CVA-18) at sea in the Far East, 5 January 1955, at the time of the Tachen Islands evacuation. Official U.S. Navy Photograph, from the collections of the Naval Historical Center (# NH 97508). USS Wasp somewhere in the Pacific, 1955. We were on board from K-3 [airfield] Korea on way to Kaneohe Bay, Hawaii. Our squadron VMC-1, USMC was relocating. 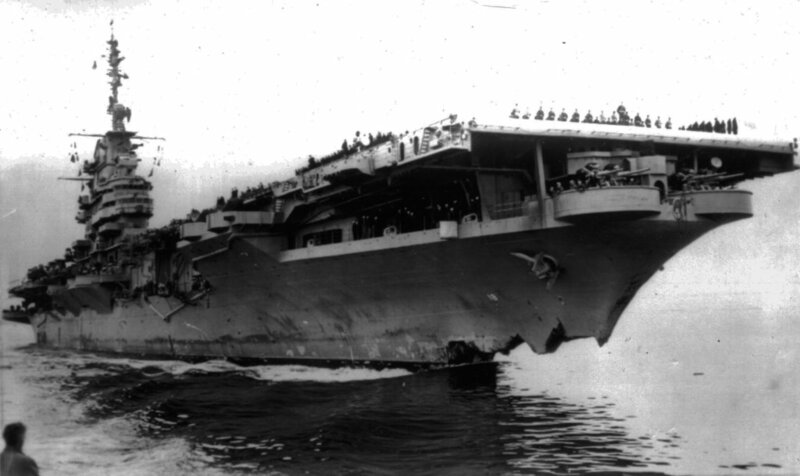 The carrier was headed to San Diego, then to San Francisco to get a canted deck . This is a shot of the Marine Gun Detachment practicing. I remember when we landed in Hawaii I thought the whole island moved when we docked. 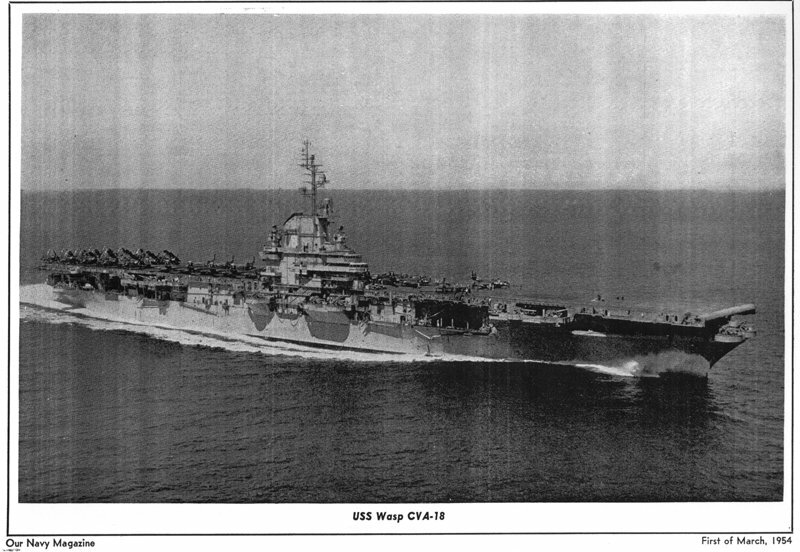 Archive Manager note: Wasp returned to San Diego in April 1955, then entered the San Francisco Naval Shipyard in May for a 7-month conversion and overhaul that included installation of a "canted" flight deck (as it was known at the time) and a "hurricane" bow. 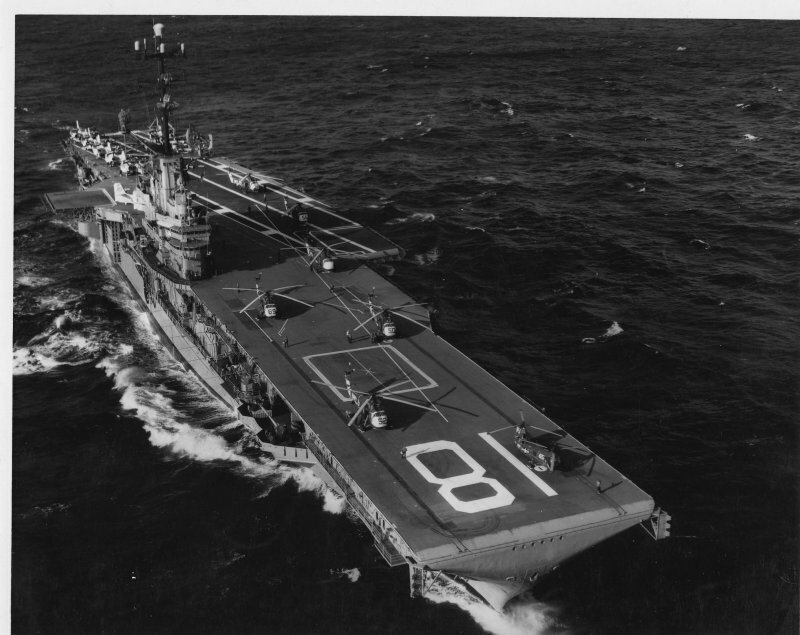 USS Wasp (CVA-18) underway in the mid-1950s. Postcard. 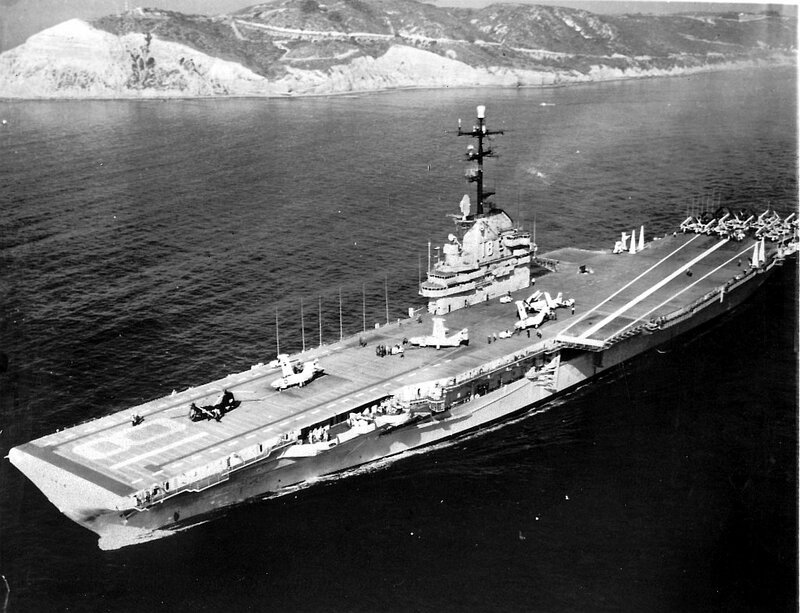 USS Wasp (CVA-18) at San Diego in 1956. A U.S. Navy McDonnell F2H-3 Banshee (BuNo 127529, modex H204) of Fighter Squadron (VF) 152 "Fighting Aces" after recovering aboard USS Wasp (CVA-18). 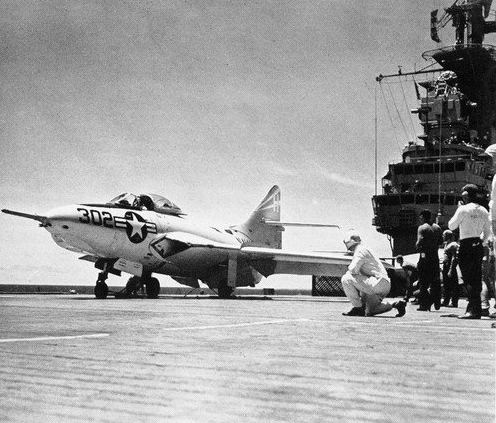 VF-152 was assigned to Carrier Air Group (CVG) 15 aboard the aircraft carrier for a deployment to the Western Pacific, 23 April–15 October 1956. A U.S. Navy Grumman F9F-8B Cougar from Fighter Squadron (VF) 153 "Blue Tail Flies" on the catapult of the aircraft carrier USS Wasp (CVA-18), 1956. 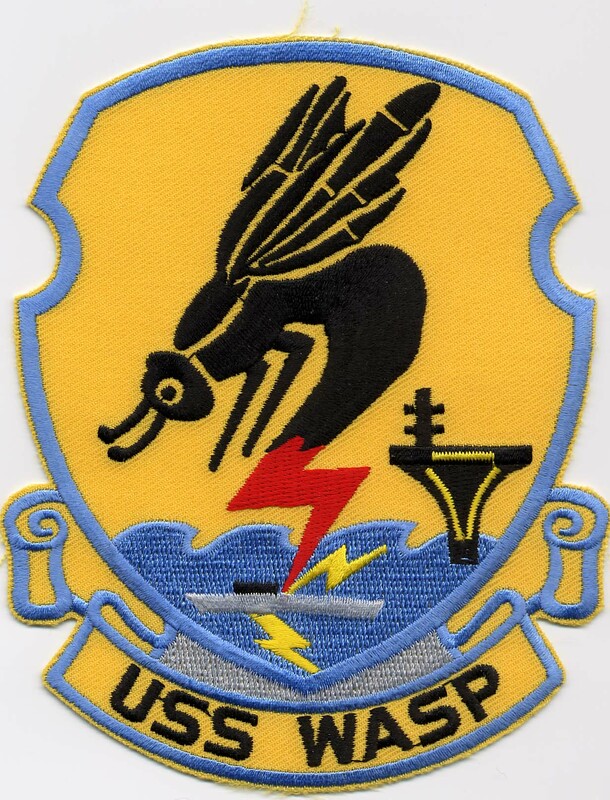 VF-153 was assigned to Carrier Air Group (CVG) 15 aboard Wasp for a deployment to the Western Pacific, from 23 April to 15 October 1956. U.S. Navy photo from Wasp 1956 Cruise Book. 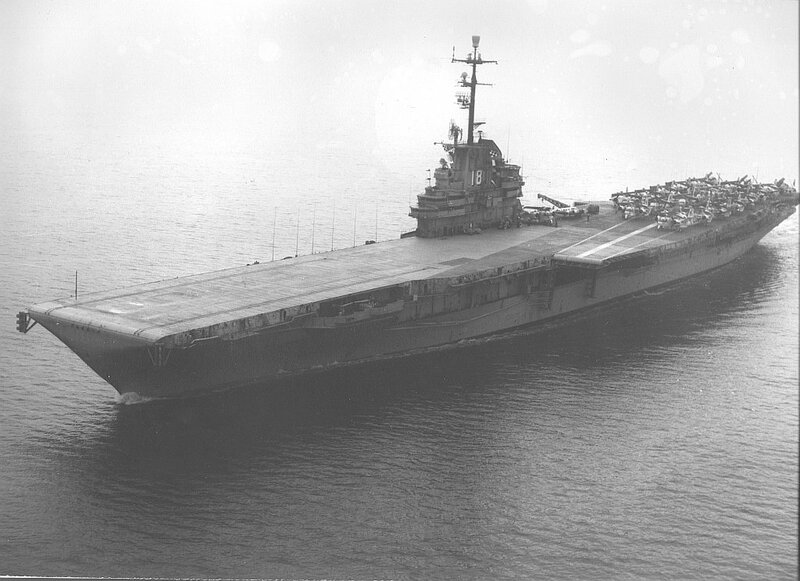 USS Wasp (CVS-18) underway in a photo probably taken in the late 1950s, early in her CVS career, location unknown. 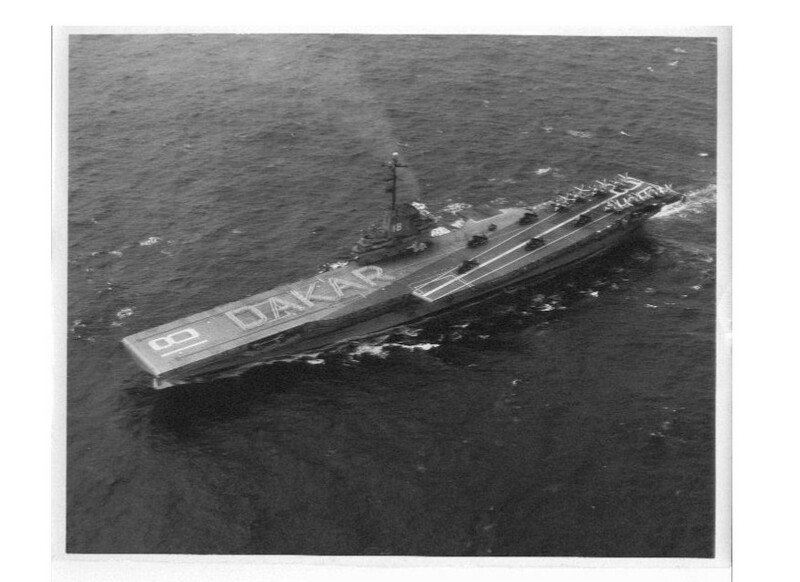 Note the early-type landing area markings on her angled deck area. 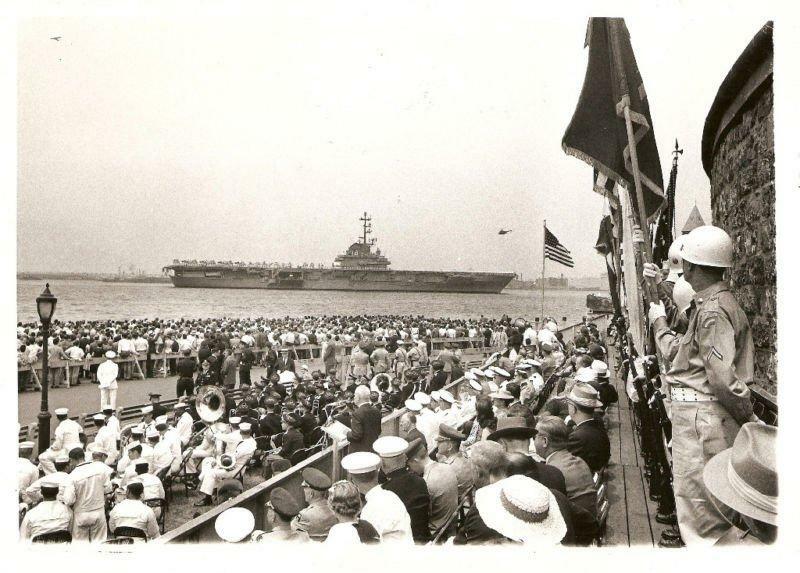 USS Wasp (CVS-18) departing New York, late 1950s-early 1960s. Quonset Point, RI, October 1957. Quonset Point, RI, October 1957. 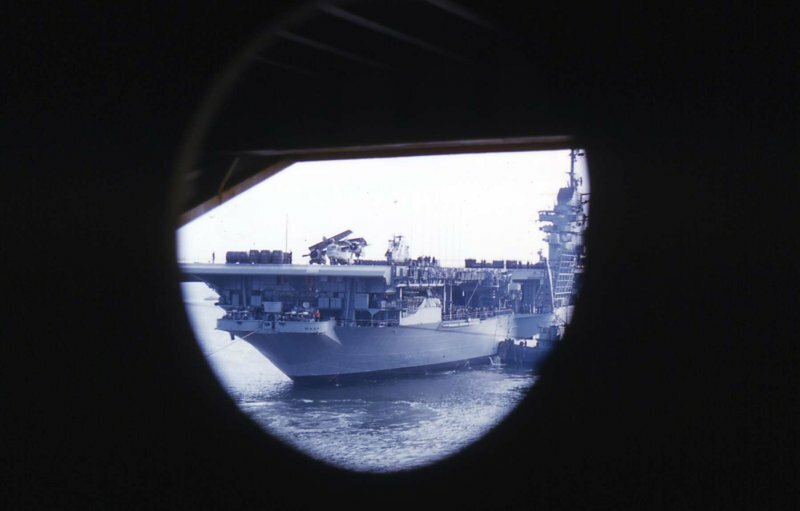 Seen from USS Tarawa (CVS-40). 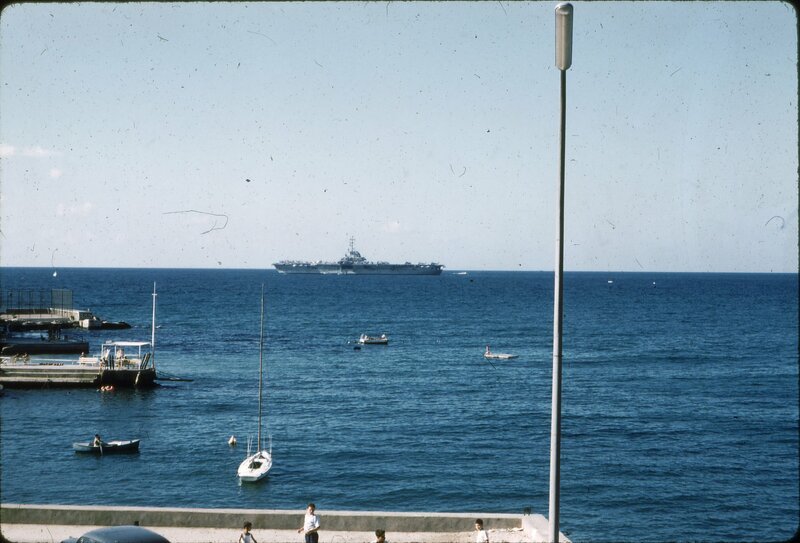 USS Wasp (CVS-18) off Beirut, Lebanon, August–September 1958. Photo by Ron Schafer, who was serving aboard USS Fort Snelling (LSD-30) at the time. 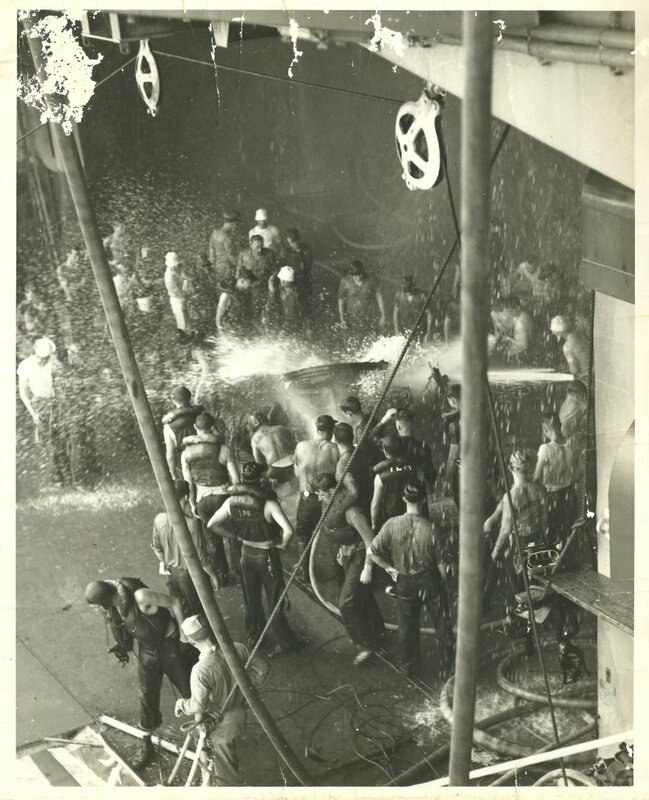 "CVS-18-7180-6-8-59 Atlantic Ocean (August 19, 1959)—Burned helicopter being jettisoned overboard after an explosion and fire in Hangar Bay #1 of USS Wasp (CVS-18)." 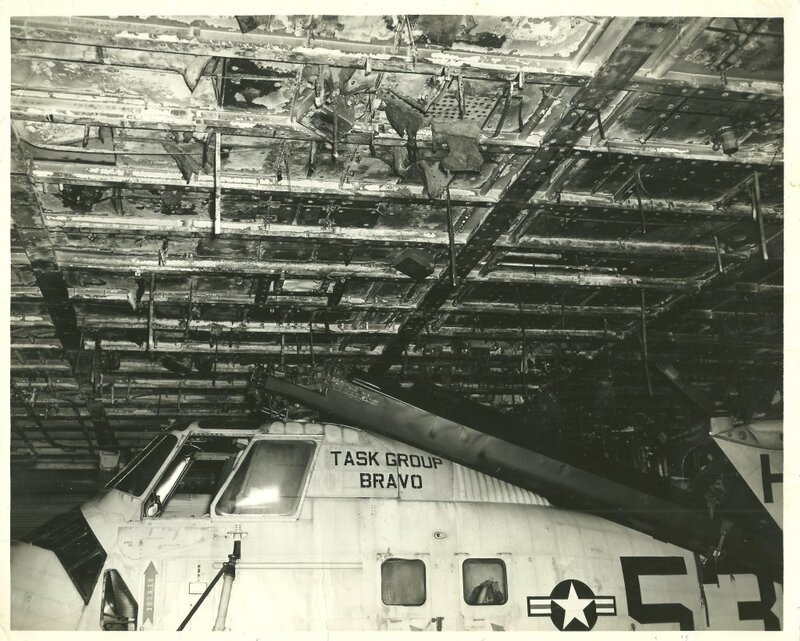 "USS Wasp is heavily damaged by an explosion and subsequent fires when a helicopter engine explodes while being tested in hangar bay number 1. The fires and reflashes take over two hours to control. At the time of the accident the Wasp was carrying nuclear weapons. In the first 30 minutes as the fires burned out of control and the forward magazines were flooded, preliminary preparations also were made to flood the nuclear weapon magazine. It was not flooded, however, and 30 minutes later the nuclear weapon magazine reported no significant rise in temperature." "CVS-18-7183-L-8-59 Atlantic Ocean (August 19, 1959)—A view showing the fire damage to Hangar Bay #1 aboard USS Wasp (CVS-18)." 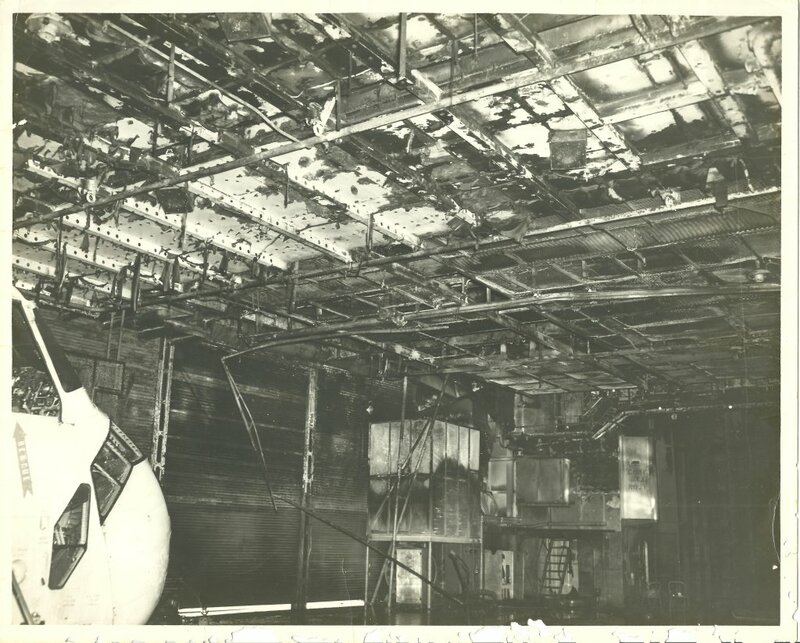 "CVS-18-7185-L-8-59 Atlantic Ocean (August 19, 1959)—Another view of the fire damage to Hangar Bay #1 aboard USS Wasp (CVS-18)." 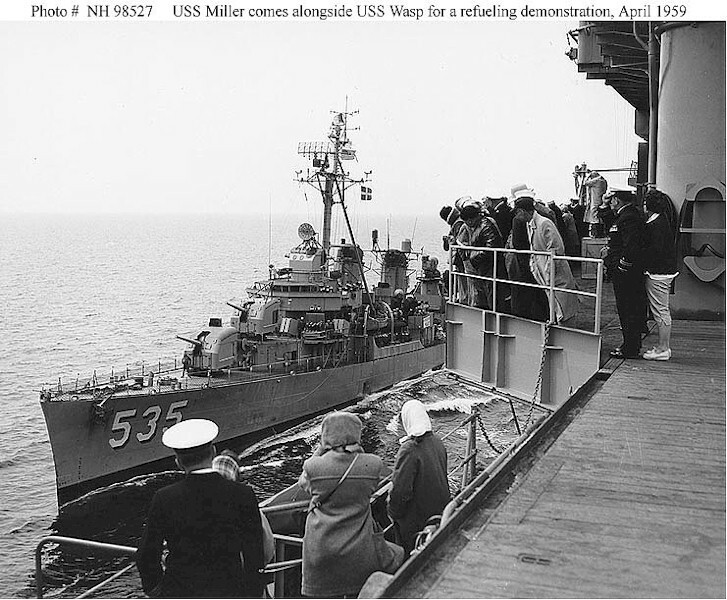 USS Miller (DD-535) comes alongside USS Wasp (CVS-18) for a refueling demonstration during the carrier's family day cruise, 16 April 1959. Some of Wasp's crew members and their families are observing the evolution. 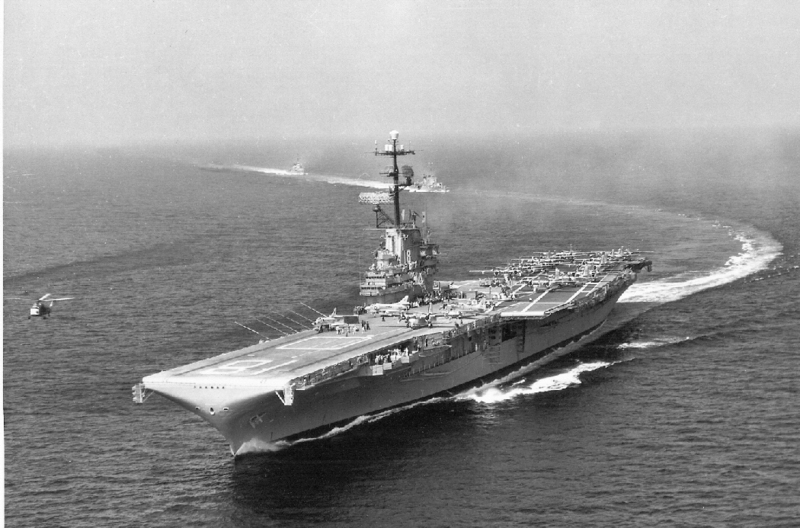 USS Wasp (CVS-18) underway, first half of the 1960s. 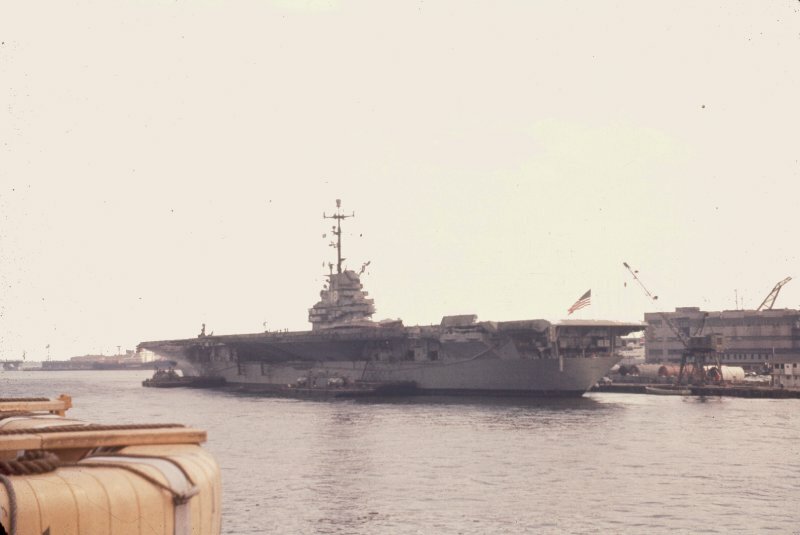 USS Wasp (CVS-18) underway in the 1960s, location unknown. 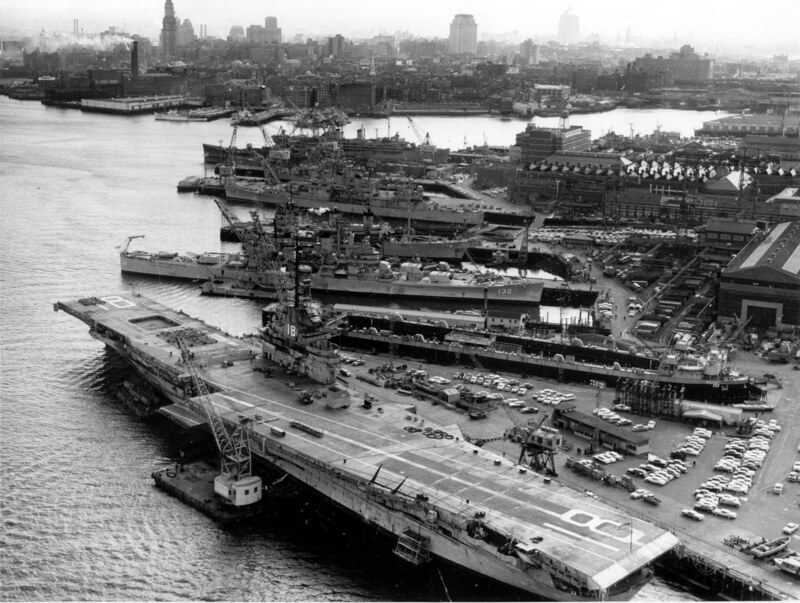 Aerial view of Boston Navy Yard, looking Southwest, 1 April 1960. Photo taken by a helicopter from Naval Air Station South Weymouth. U.S. Navy photo, Boston NHP Collection, NPS Cat. No. BOSTS-10111). 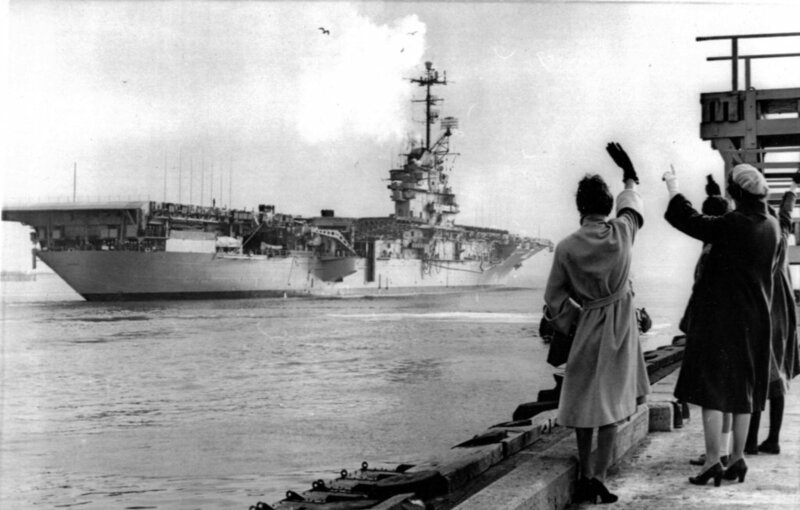 USS Wasp (CVS-18) departs Boston on 22 November 1960. Photo from the files of the Vallejo Naval & Historical Museum (# CVA 18 322X1-11-60). USS Wasp (CVS-18) in formation with destroyers and aircraft of Anti-submarine Task Group Bravo, in the Mediterranean Sea, 19 August 1961. All escorts are Gearing-class DDEs. Planes overhead include ten S2F and two AD-5Ws. 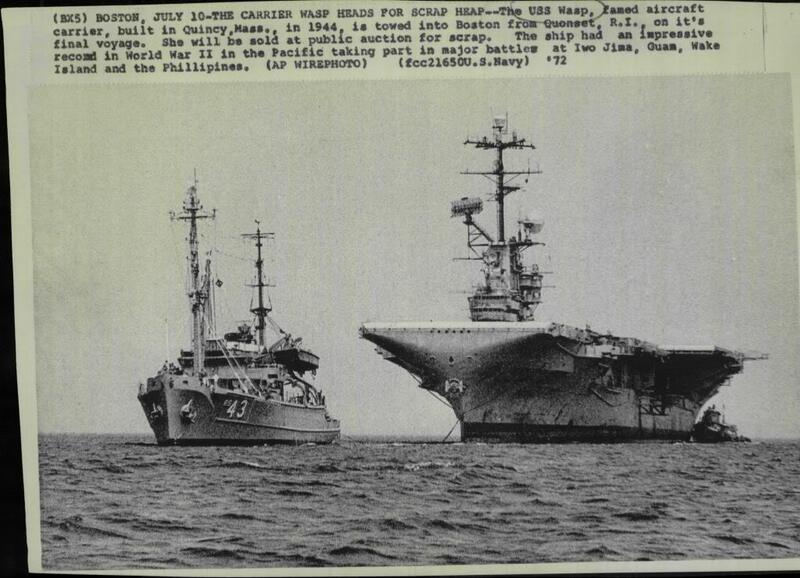 Two HSS-1 helicopters are flying just above the ships. Official U.S. Navy Photograph (# USN 1057640). 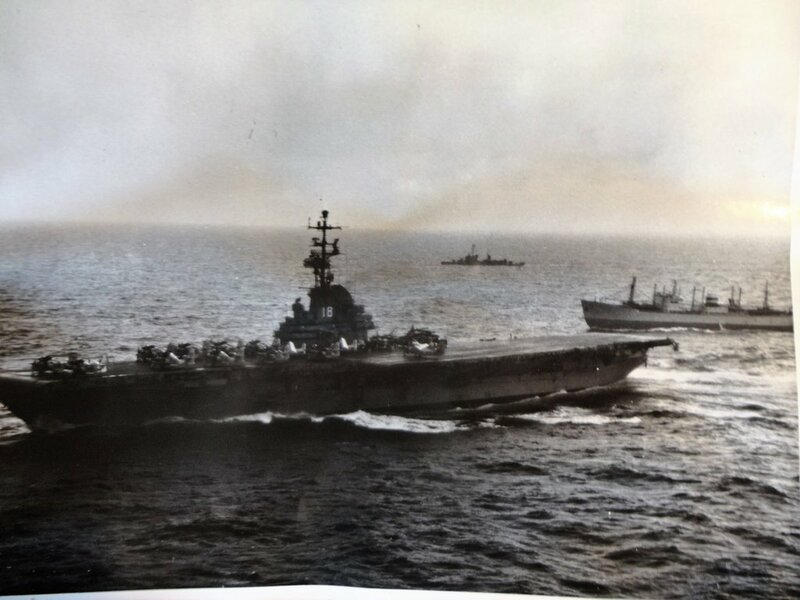 USS Wasp (CVS-18), with embarked Antisubmarine Carrier Air Group (CVSG) 52, toward the end of the Cuban missile crisis in late 1962, as she pulls away from the Soviet freighter off her starboard quarter, which had displayed on deck the missiles it was removing from Cuba. Official U.S. Navy photograph. 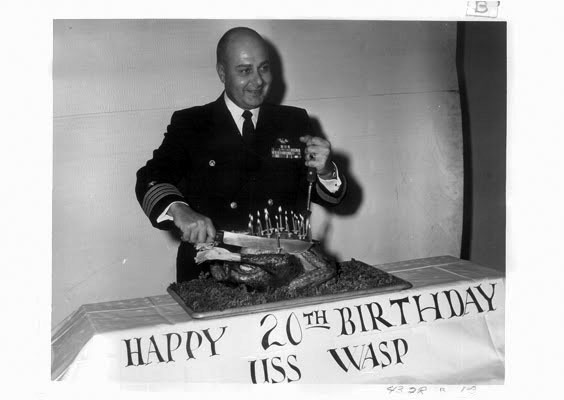 USS Wasp Commanding Officer, CAPT Edward Robinson Fickenscher, Jr., lighting candles and ready to carve a turkey in celebration of the 20th Anniversary of the carrier's commissioning, November 1963. U.S. Navy photo, Boston National Historical Park Collection, NPS Cat. No. BOSTS-14667. 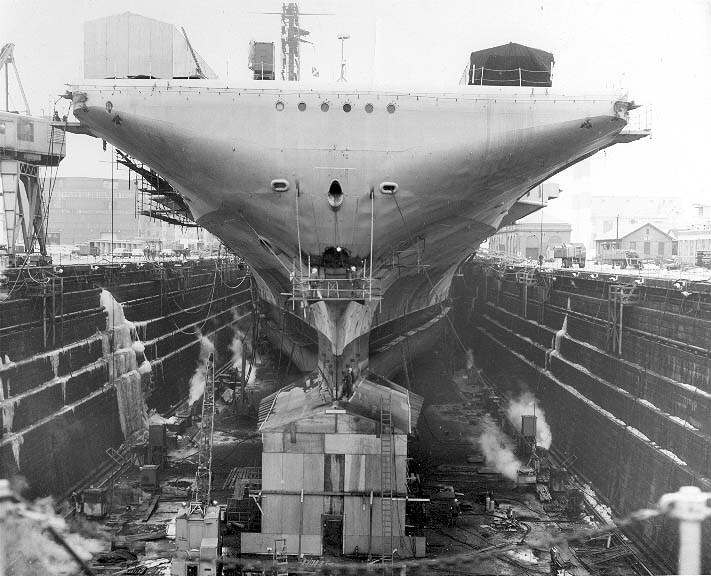 USS Wasp (CVS-18) is seen in Dry Dock 3 at the South Boston Annex of the Boston Naval Shipyard on 6 January 1964 during her FRAM overhaul. U.S. Navy photo, Boston National Historical Park Collection, NPS Cat. No. BOSTS-14630. 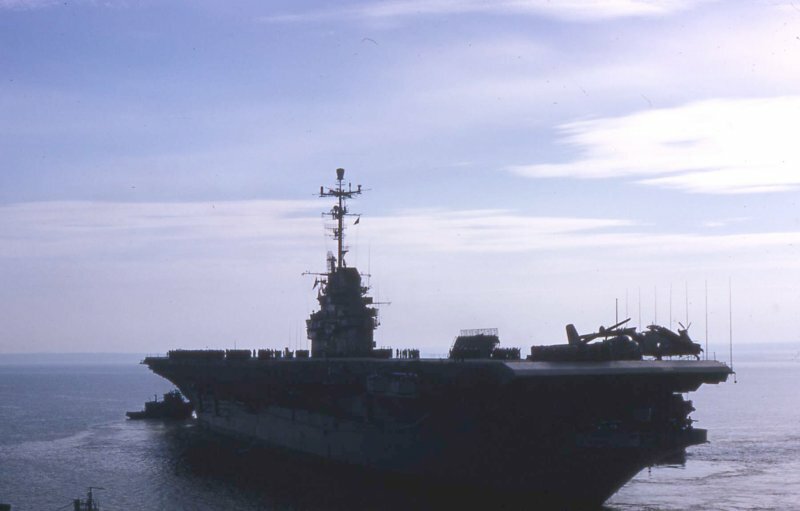 Stern quarter view of USS Wasp (CVS-18) conducting sea trials out of Boston, March 1964. 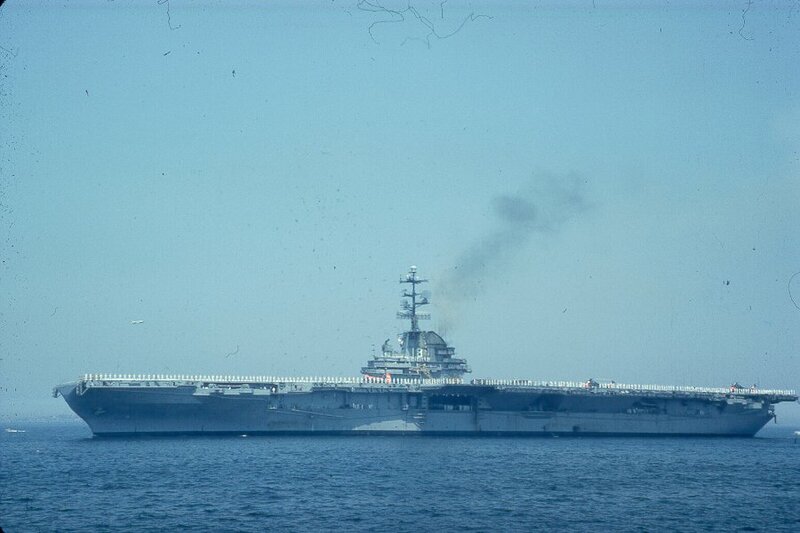 The carrier had just completed her FRAM overhaul (fall 1963–March 1964) at the Boston Naval Shipyard. US Navy and Marine Corps Museum/Naval Aviation Museum, photo # 1996.488.053.017. Robert L. Lawson Photograph Collection. 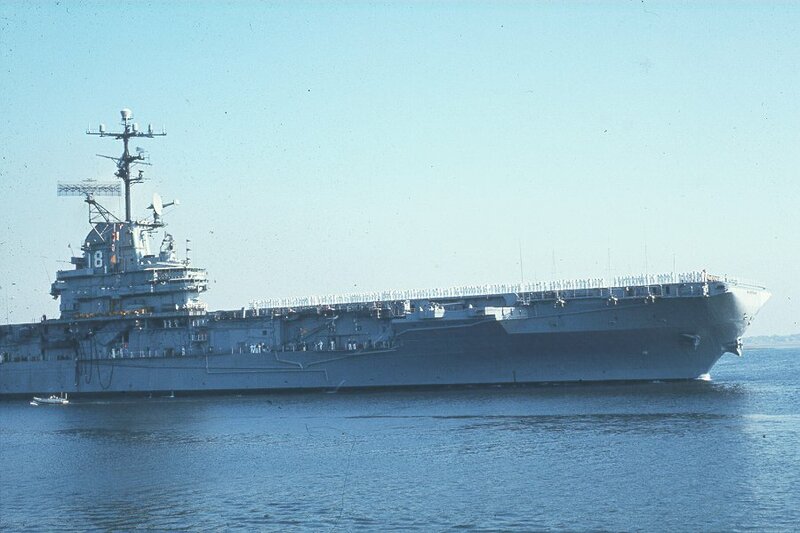 The ASW aircraft carrier USS Wasp (CVS-18) underway circa 1964, location unknown. 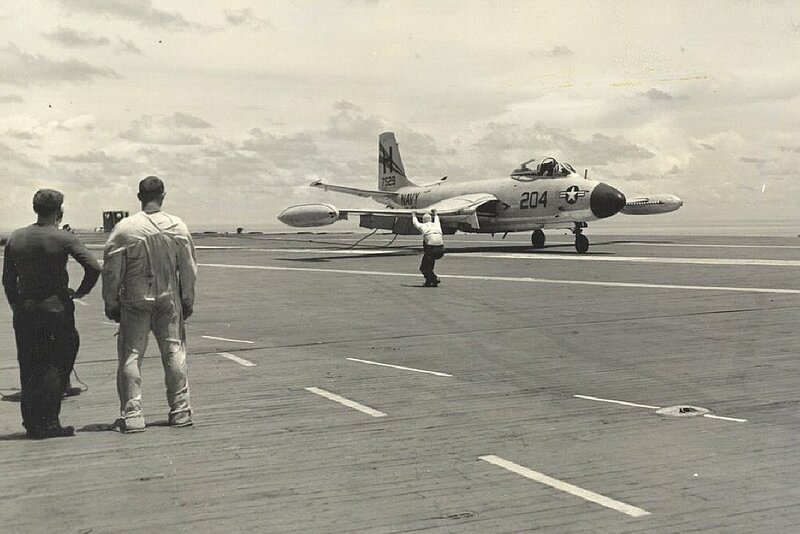 Note A-4 Skyhawk and S-2 Tracker aircraft on her flight deck. 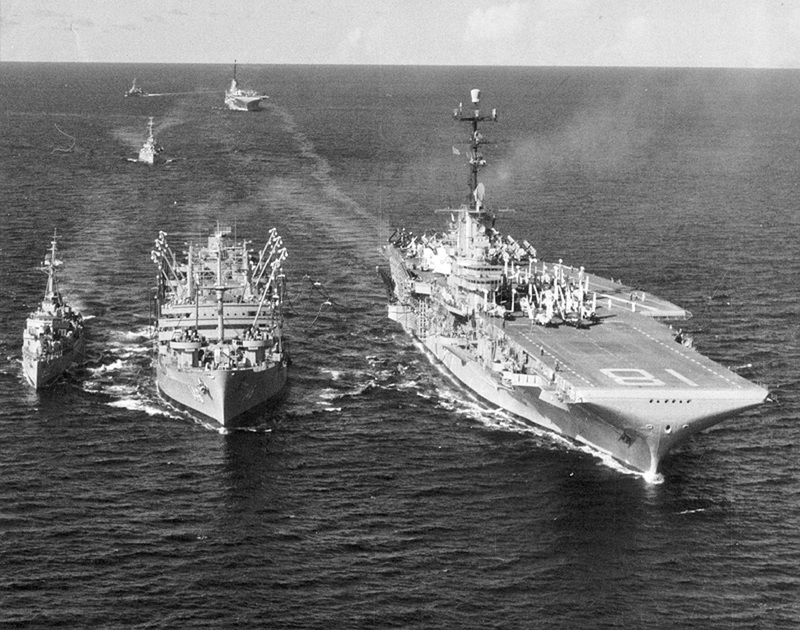 Wasp is shown leading two of her escorting destroyers. 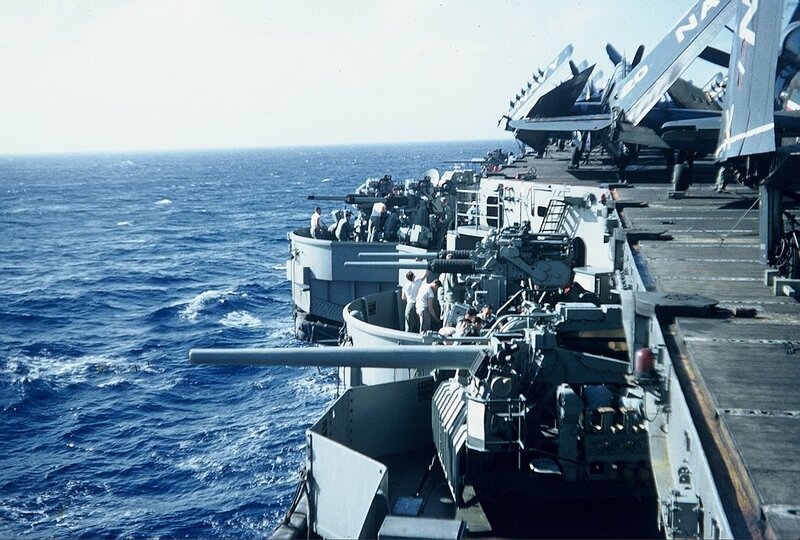 Official U.S. Navy photo from Jane's Fighting Ships 1964–1965. USS Wasp (CVS-18) underway with Task Group Bravo. 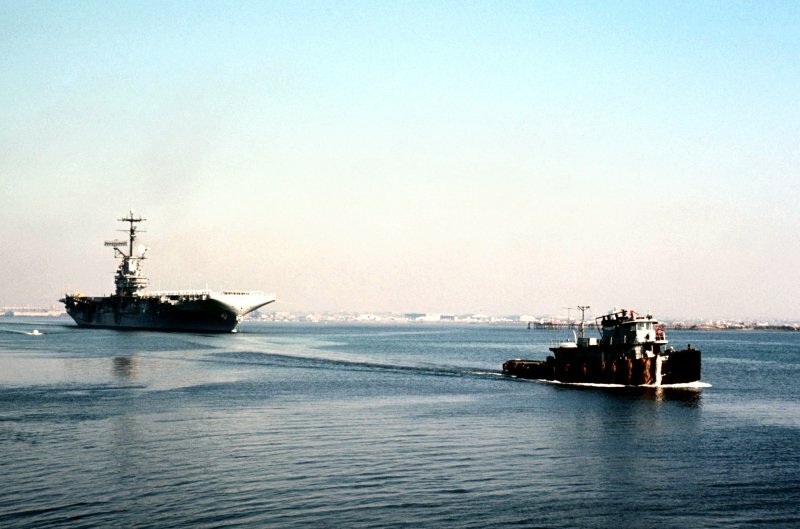 Wawasee (YTM-367) and USS Wasp (CVS-18) underway in Boston Harbor, 7 September 1964. 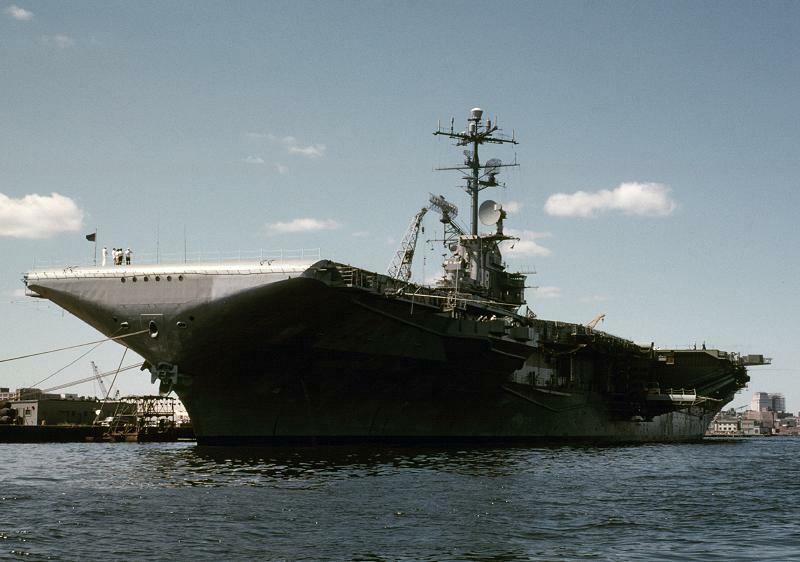 "BOSTON, JULY 10[, 1972]–THE CARRIER WASP HEADS FOR SCRAP HEAP—The USS Wasp, famed aircraft carrier, built in Quincy, Mass., in 1944 is towed into Boston from Quonset, R.I., on it's [sic] final voyage. She will be sold at public auction for scrap. 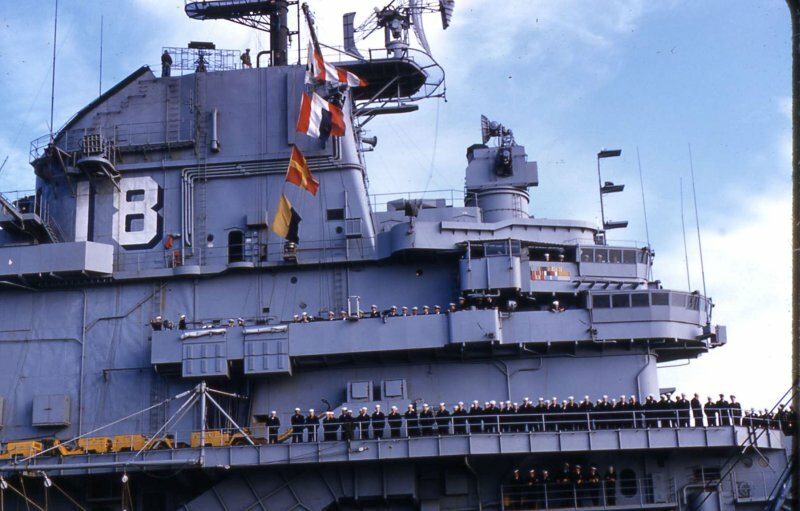 The ship had an impressive record in World War II in the Pacific taking part in major battles at Iwo Jima, Guam, Wake Island and the Philippines. 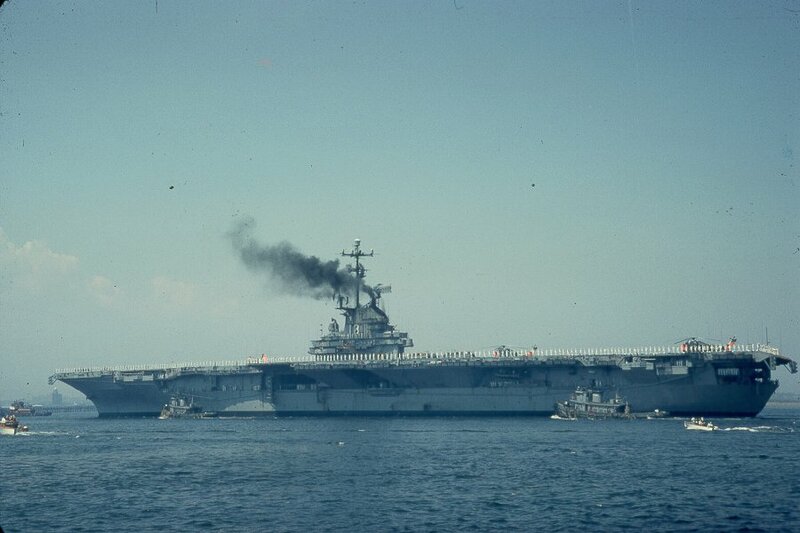 (AP WIREPHOTO) (fcc21650U.S.Navy)"